The man in charge of Saturday’s game at the New York Stadium in Tony Harrington from Cleveland. Tony was at the New York Stadium in December when West Brom were in town. It was a heavy home defeat for the Millers (four-nil) which saw a Dwight Gayle hat-trick and another from Harvey Barnes. He was also here in November which saw visitors Swansea City take the lead on the twenty-fifth minute. But Tony went on to award the Millers two penalties in the second half which Ryan Manning put away to give the hosts a two-one win. Before this season his last time in charge of the Millers was in April 2017 for the South Yorkshire derby against Sheffield Wednesday, again at the New York Stadium. Two goals from Steven Fletcher in the first half gave the Owls all three points with yellow cards being shown to Will Vaulks and Joe Newell. Tony was also in charge of the Millers in December 2016 when Burton Town were the visitors to the New York Stadium. Former Miller Chris O’Grady opened the scoring for the visitors with Jackson Irvine making it two-nil on the forty-first minute. Tom Adeyemi gave the Millers some halving the deficit right on half-time but Burton went home with all three points. Darnell Fisher, Lee Frecklington and Danny Ward were booked alongside three Burton players that afternoon. The time before that when Tony was in charge of a Rotherham game was on a cold Friday night in December in 2015 at Ewood Park when the only goal of the game was a terrific header from Luke Hyam on the half-hour mark – unfortunately he put it past Lee Camp to give Rovers the win. Kirk Broadfoot was the only player booked that evening. The season before he was in the middle for our game at the New York Stadium against Blackpool. Jordan Bowery came off the bench and put the Millers ahead on seventy-eight minutes only for Steve Davies to equalise seven minutes later. Tony booked three players that day, all Millers – Paul Green, Ben Pringle and Manu Ledesma. In October 2013 Tony was in charge of our game against Tranmere when Kieran Agard opened the scoring for the Millers on the hour mark. After having a penalty appeal turned down for handball themselves, the Millers were annoyed when Mr Harrington said that Joe Skarz had pushed former Millers loanee Abdulai Bell-Baggie over in the area and pointed to the spot. Ryan Lowe scored from the spot to make it one-all and a point-a-piece. Twelve months before saw Southend visiting the New York Stadium which was Tony’s first visit there – and it was one that Millers fans want to forget. The sides went in goalless at half-time but two goals in the second half form Britt Assombalonga plus another from Dave Martin gave the visitors a three-nil win. In the nineteen games Tony has been in charge of this season he has shown sixty-seven yellow cards and one red card. 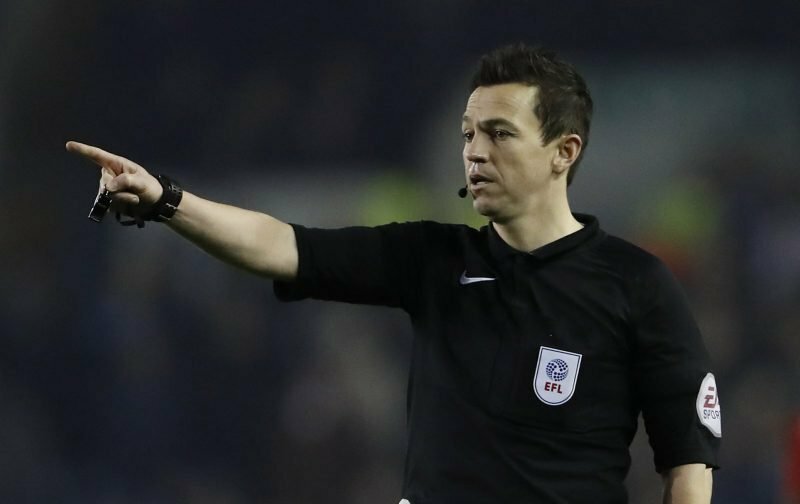 Running the lines on Saturday we have Shaun Hudson and Adam Matthews with the Fourth Official being Matthew Donohue.